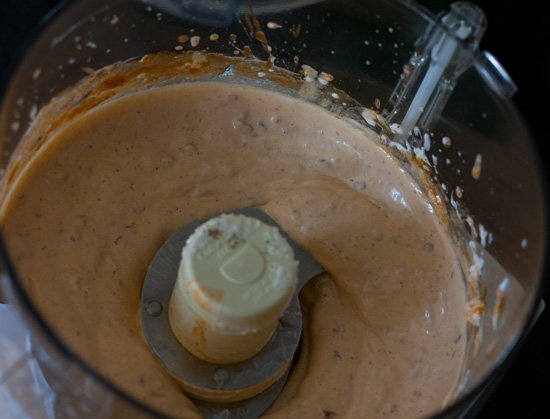 First, make the chipotle dippin’ sauce. I just love chiles in adobo sauce. They are smokey and hot. It makes a great dip. 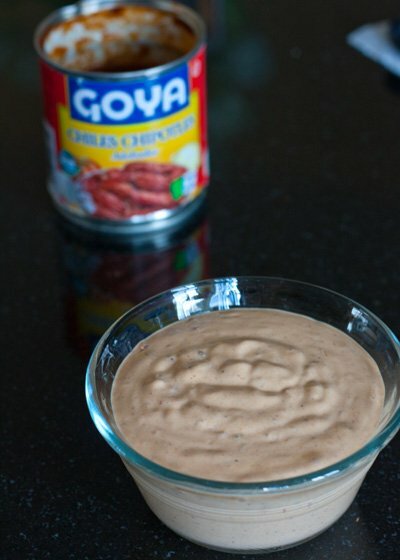 Simply take out 3 whole chipotle peppers from the can along with 2 T of the adobo sauce and put it in a food processor. 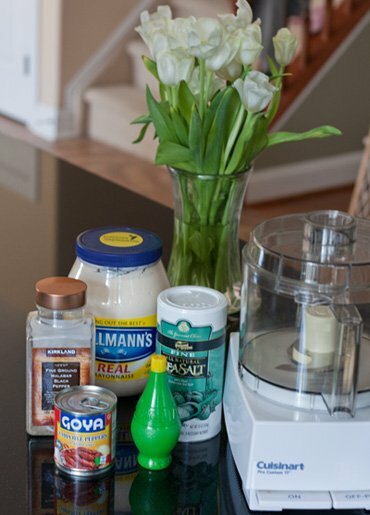 Add the mayo, lime juice and a little salt and pepper. Pulse it until it is smooth. In my opinion rotisserie chicken is the only way to go. 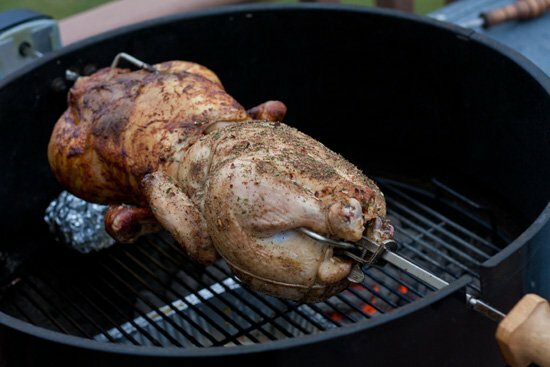 Putting a chicken on the rotisserie is better than any other method of chicken preparation including beer can chicken and just plain old roasting. Rotating on a spit in front of live fire allows the juices to just roll around the chicken making it so tender and amazing tasting. Normally salt and pepper are all you need for fantastic rotisserie chicken. But to be crazy I made up this spicy dry rub, based off of a Steven Raichlen recipe. Mix together all of the dry rub ingredients and completely coat the inside and outside of the chicken. After the rub is on the chicken go ahead and set up the grill. 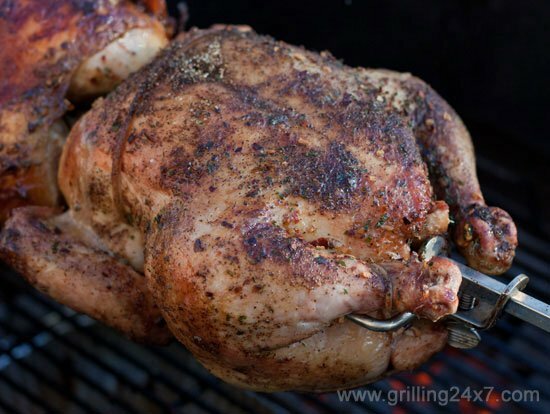 The chicken can sit at room temperature while the grill gets going. I used about 3/4 of a charcoal chimney full of coal and dumped it to one side of the grill. I sat a water pan in the bottom to catch the drippings. Not too full of water, but enough to prevent the drippings from burning. I was aiming for 400-450 degrees. I tried to keep the dome closed the entire time but the chickens are so attractive I had to open it to take numerous photos! After about two hours a thermometer registered 170 degrees deep in the breast so I took off the chicken and let it rest. I pulled out the chipotle dippin’ sauce for dunking and cut up the chicken. Wow. This dry rub is just fantastic on poultry. 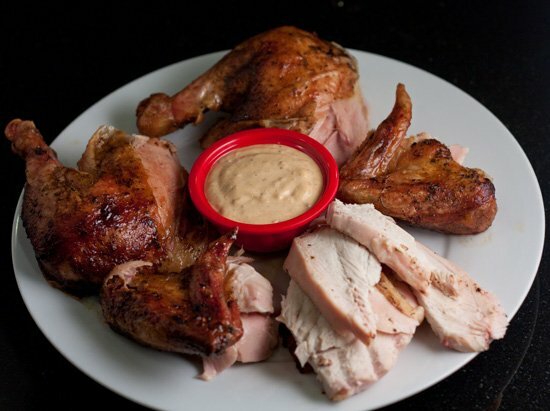 I love the rub on Thanksgiving turkey and it also is killer on rotisserie chicken. 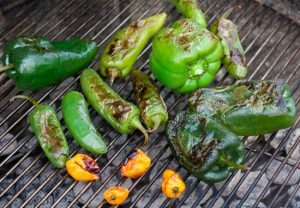 The chipotle dippin’ sauce is nice and cool with a sharp smokey spicy flavor from the chiles. 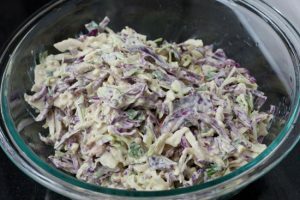 This is going to make some fantastic chicken salad leftovers! Note: I’m in love with this Peruvian rotisserie chicken restaurant that is located near my work. It’s called “Crisp and Juicy” and the rotisserie chicken that they serve is just the best. I scoured the internet looking for Peruvian rotisserie chicken recipes. There are a few recipes, all with very minor changes to one another. They all call for white wine, vinegar and some spices mixed together in a wet rub. Unfortunatly, the internet Peruvian rotisserie chicken recipes are not right. They don’t have the same flavor as what you get in the restaurants. The recipe I discuss above is not a Peruvian rotisserie chicken recipe but it is similar. It’s similar in that it has a great spice, a nice dipping sauce and the great tenderness of a rotisserie chicken. Looks like a great BBQ chicken!! 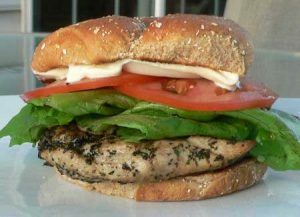 Any luck on finding a Peruvian pollo recipe (pollo a la brasa)? I love the stuff. Like you I have been trying to find a good recipe to reproduce the stuff I ate in Peru. Sign up to get the latest recipes, reviews and grilling tips. Replacement Weber Flavorizer Bars for Great Performance!